Kevin Kinahan, Billy Dooley, David Dooley, Johnny Dooley, Joe Dooley and Brian Whelahan at the 'Hurling with the Stars' fundraiser in Drumcullen GAA. The famous Dooley brothers, Joe, Billy and Johnny, who scored 2-11 between them in the never-to-be-forgotten 1994 All-Ireland final victory over Limerick, lined out alongside the likes of Brian Whelahan, Kevin Kinahan, Martin Hanamy and Jim Troy. The '94 team will meet up again on Friday, May 10 when they celebrate the silver jubliee of their success at the Tullamore Court Hotel. Joe Dooley tweeted this lovely photo after yesterday's game. 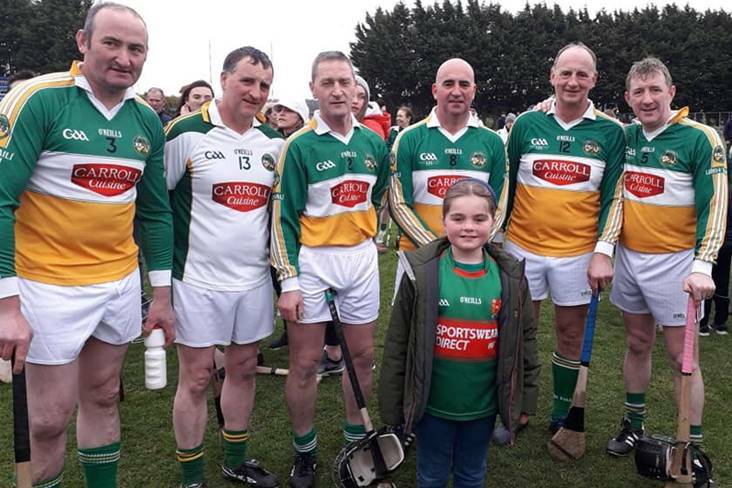 It includes (from left to right): Kevin Kinahan, Billy Dooley, David Dooley (who was a sub in '94 and is still playing for his club Coolderry at the age of 48), Johnny Dooley, Joe Dooley and Brian Whelahan.